Orangeries were used in centuries past as a place to overwinter citrus trees. 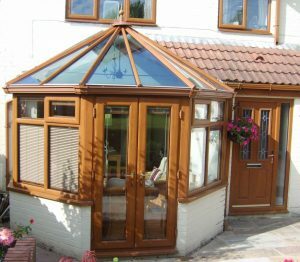 Nowadays along with conservatories they are used as a home extension providing a bright and elegant living space. An Orangery is a similar construction to that of a conservatory both using a base of stone or brick instead of just one material. Conservatories are made from UPVC materials giving them durability against the elements, are easily constructed and maintained and give them a long life. Orangeries are generally made from a mixture of stone or brick base followed by a wooden framed structure that has glass mounted panels. The roof is usually a roof lantern that is shaped to allow maximum light to enter and is mounted within a flat, plastered ceiling with lights fitted making the inside feel like another room of your house and with greater insulation enabling you to use it through the cold winter months. You can customise your design to make a unique space that meets all your criteria. Speak to us about your ideas so we can offer further guidance on your choices. Delivering Personalised Glazing Service In Yorkshire - Call NOW!